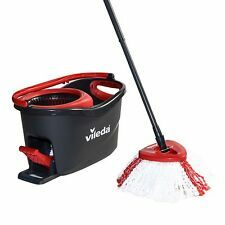 Vileda Easy Wring and Clean Turbo Spin Mop & Bucket System. The system’s technological breakthrough lets you clean deeply and scrub with an ultra-absorbent string mop, and wring it perfectly and easily by pressing a variable pressure foot pedal leaving your hands clean and dry. Spare head for Vileda. Vileda Easy Wring & Clean Turbo Wiper Insert. - Suitable for the Easy WRING and CLEAN swivel mop. and just WRING and clean TURBO. - Product Type: Removable mop tip. - The wiper insert is interchangeable and can be washed at 60 ° C.
Microfibre refill head for the Vileda Easy Wring & Clean. 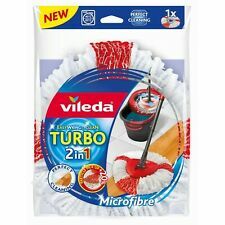 Easy Wring and Clean Turbo Microfibre Spinning Mop and Bucket Set Vileda UK NEW! Refill pad for the Vileda Active Max Mop. The Vileda active max flat refill is ideal for thorough wet cleaning of all hard floors, especially wood and laminate. The trapezoid shaped head makes cleaning into corners easier, whilst the large size makes it ideal for bigger floor areas. 2X VILEDA MAGIC FLAT MOP CLEANING FLASH FLOOR REFILL HEAD 3D GROOVED SURFACE NEW. Microfiber Mop Vileda SuperMocio 3Action XL. Supermocio Completo 3 Action box. - The bucket is durable and has a flexible, modernized sieve, catching the mop from its very root. 3-piece, foldable mop handle. Absorbent Sponge mop with angled flat head. Product Title Goes Here. Non-scratch scrubbing edge enables easy removal of stubborn marks. 3D grooved foam gives better cleaning performance. Bookmark Us. Refill pad for the Vileda Active Max Vileda Active Max Flat Mop is great for thorough wet cleaning of all hard floors, especially wood and laminate.Microfibres help to remove stubborn dirt, whilst the cotton fibres improve absorbency for a better cleaning pad is easy to remove for rinsing and can be machine washed at up to 60°C. Suitable for ULTRAMAX flat mop, ULTRAMAX kit, 1-2 SPRAY ULTRAMAX mop, EASY WRING ULTRAMAT mop and ULTRAMAT TURBO mop. ULTRAMAX is a state-of-the-art technology and user friendliness. 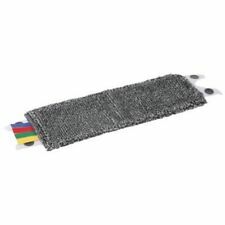 - The mop cover is also intended for cleaning floors. 1 REFILL HEAD ONLY. Highly absorbent cotton to quickly dry floors. Vileda SuperMocio 3Action Mop & Handle 1 Refill. • Machine-washable mop head. Made from absorbent sponge with a 3D grooved surface for better cleaning performance. Microfibre Turbie Towel. Releted Products. Do not send us back straight without confirmation. Easy to fit on to mop handle using screw fitting, Suitable for use with magic mop three action, also fits older style magic mop. We will make every effort to respond your inquiries as early as possible usually within 24-48hrs. For use with Vileda Ultramax and 1,2 Spray System. Ideal for parquet & laminate. 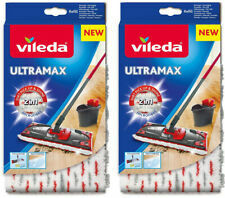 The Vileda Ultramax Refill is designed for use with either the Vileda Ultramax mop or the Vileda 1 2 Spray mop. Refill pad for use with either Vileda Ultramax or Vileda 1 2 spray mop. The press studs fasten it securely to the mop head and this unique design ensures that it remains in place when used with the Ultramax Bucket & Wringer, helping to keep your hands dry. Microfiber refill head for the Vileda easy wring and clean. Mop head is absorbent with microfibers to easily clean even greasy dirt. Mop head is machine washable at up to 60 degrees Celsius. Abrasive pad removes stubborn marks. Set of 3 Mini Freezer Blocks. For Lunch Bags, Lunch Boxex, Cool Boxes. Releted Products. Do not send us back straight without confirmation. - 25% faster cleaning. Easy to remove and machine washable. Vileda Magic Mop Refill - Sponge mop refill head with 50% improved hair and particle pick up. - Tackles stubborn dirt. - Increased absorbency. - Easy to fit onto mop handle, using a screw fitting. - Use with Vileda Magic Mop 3 Action.Also fits older style Vileda Magic Mop. Vileda Easy Wring And Clean Turbo Mop & Bucket Set With Power Spin Wring. 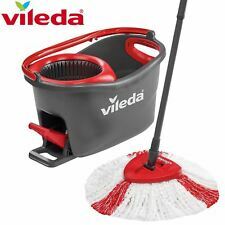 Vileda Easy Wring and Clean Microfibre Mop and Bucket with Power Spin Wringer. Microfibre mop head is absorbent and will clean even greasy dirt. These refills are to be used with the Magic Mop Flat which is fantastic at cleaning your tiled or vinyl floors. The Magic Mop Flat Refill is the ideal choice to keep your flat mop in tip top condition. The lemon shaped head makes it easier to clean into those hard to reach corners. To remove the head simply pull the head and handle apart or alternatively, place the mop head on the floor, put foot firmly on it and the pull up on the handle, keeping the handle away from body. Made from absorbent sponge with a 3D grooved surface for better cleaning performance. Angled head fits into tight, awkward places. Abrasive pad removes stubborn marks. Sistema Hydrate Twist 'n' Sip Drinks Water Bottle 620ml Green. Cloth edge to wipe floors clean and dry. Personal Care. The EasyWring Turbo Classic Microfibre Refill is compatible with both the EasyWring & Clean and the EasyWring & Clean Turbo sets, with absorbent microfibres that easily clean even greasy dirt, with a unique triangular head shape to reach corners. 3FT LONG HANDLE 1 1 REFILL FREE. Microfibre Plus Cleaning Zone with Pick-Up Pocket Technology: The combination of the dark blue microfibre plus cleaning zone with its superior cl. Lemon shaped head for better corner cleaning. Vileda magic mop with spare head.Grooved rollers for effective wringing. Mop is wrung out with a push/pull action squeezing the mop head between the rollers. Absorbent sponge mop with angled head for faster and more cleaning. Vileda Turbo Classic Easy Wring and Clean mop insert. - Material: Microfibre. - Type of bristles: Microfibre. - Mop perfectly cleans all types of floors - including panels and parquet, and works great when cleaning tiles and glass.